Eccentricity is one of the great British pastimes. History is full of figures who displayed peculiar quirks or held strange beliefs, but these people managed to take it to new heights. Henry Paget did not look like your typical English Lord. Londoners of the late 19th century could have seen him parade through the city center wearing lavish colorful gowns and robes, donning jewel-encrusted tiaras, and carrying a pink-ribbon poodle under his arm. Or perhaps they would have noticed him on the road, driving cars which had been modified to emit perfume out of the exhaust pipe. Henry Cyril Paget was a man who loved attention and he was known to perform sensual dances for his audiences. He converted the family chapel into the Gaiety Theater where he staged free performances. Eventually, in 1901 he decided to go “pro” and hired an actual theater troupe. They would tour with Paget and put on whatever plays struck his fancy in exchange for exorbitant salaries. Paget became Marquess of Anglesey in 1898. With his title also came a large estate and family fortune. In 1904, he was forced to declare bankruptcy. Paget had completely squandered his money on his expensive habits and left his family in crippling debt. Everything he ever owned was sold to help pay off his creditors, including his pet parrot. The auction was a notable event in of itself. People knew from the papers that Paget had spent his fortune on an extravagant wardrobe, but it was quite a different sight to see hundreds after hundreds of items made from the finest silks and augmented with the prettiest jewels paraded before them. Staying in late 19th century London, we look at the woman who struck fear into the hearts of the city’s cabmen. Her name was Caroline Giacometti Prodgers and she was what we would call today a “vexatious litigant.” She was in the habit of taking cabbies to court for driving her past her specified destination. 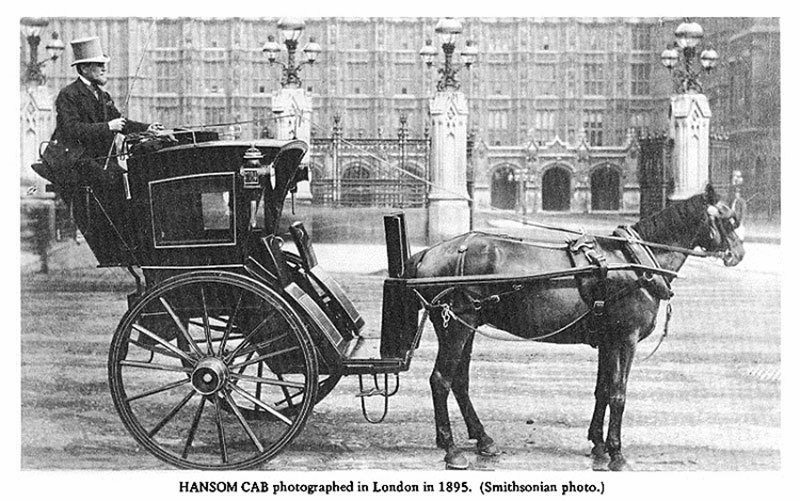 Back then, horse-drawn carriages did not have meters. There were standard fares from one predetermined location to another such as train stations, hotels, and theaters. If a person traveled a long distance, multiple fares would be added one onto another. There were also charts that displayed the charges and Mrs. Prodgers learned them by heart. She knew exactly where to stop before the cabman could start taxing for the next stage of the fare. On occasion, cabbies would drive a bit further and attempt to charge extra. Mrs. Prodgers refused and took them to court. She managed to bring over 50 such cases to court, although it is unknown how many she won. This annoyed the magistrates who suggested that the lady had the means to buy her own carriage. Cries of “Mother Prodgers” could be heard at London cabstands to warn drivers that Caroline Prodgers was coming. By 1875, her actions earned enough scorn that one cabbie even burned an effigy of her on bonfire night. According to legend, a long time ago, before there was a crossing over the River Thames where London Bridge now lies, there was a ferry run by John Overs. His successful business made him very rich but, despite his wealth, Overs was an unbelievable miser. One day, he came up with a plan to save a few coins – if he faked his own death, his family and servants would fast that day out of respect. This would allow him to save on provisions. In reality, the opposite happened. When the servants heard Overs had died, they started celebrating with all the good food and wine. Shocked by this, the old man came out of hiding to confront them and scared one of the servants who thought he was a ghost. In response, the attendant picked up an oar and smashed Overs’ head with it, this time killing him for real. His money went to his daughter, Mary Overie. Her fiancée also died soon after this event. Distraught, she used her inheritance to start a nunnery which, eventually, turned into Southwark Cathedral which still stands today. John Thomas Looney was a late 19th century English teacher who became known for, first, being a huge fan of Shakespeare and, later, doing everything he could to discredit him. Looney came up with the Oxfordian theory, an idea that said that the man known as William Shakespeare was not actually the author of his plays. Instead, the true writer was Edward de Vere, 17th Earl of Oxford. This goes to show that conspiracy theories are not a new phenomenon. The earliest written record questioning the authorship of Shakespeare’s plays dates to the mid 19th century courtesy of American writer Delia Bacon. She asserted that the works were written by a group of people chiefly led by Sir Francis Bacon. The people who doubted Shakespeare became known as anti-Stratfordians. In 1920, Looney published a book which put forward the Earl of Oxford as the main authorship candidate. His ideas became popular in anti-Stratfordian circles and experience a resurgence every now and then. Of course, there is no actual evidence to support them. Believers tend to gloss over the fact that Shakespeare kept writing plays for over a decade after Edward de Vere died and they don’t explain why the rightful author would allow a fraud to claim ownership of his work. Curiously, Looney was a huge fan of Shakespeare initially. He was part of the Church of Humanity, a positivist group inspired by the works of Auguste Comte. They literally named a month in honor of Shakespeare in the positivist calendar. The scientific credentials of William Buckland speak for themselves. He was a 19th century geologist and a pioneering paleontologist who wrote the first full account of a dinosaur which he named “Megalosaurus.” He had his quirks such as giving lectures on horseback. However, his most notable oddity was his fascination with animals – specifically, with eating them. Buckland was a practitioner of zoophagy and, if it were up to him, he would feast on every type of creature on Earth. He often hosted dinner parties where the menus consisted of mice, panthers, elephants, porpoises, and crocodile. Bluebottle flies were his least favorite food, although they still went down with a bit of butter. His passion worked splendidly with his post at the Society for the Acclimatization of Animals. He could import all sorts of creatures to eat under the pretense of testing to see if they could viably be introduced to England as a new food source. The most bizarre, possibly apocryphal story involving Buckland’s penchant for unusual edibles says that the scientist once visited the Nuneham Courtenay where he was showed an organ preserved in a silver casket, reputed to be the heart of King Louis XVI. Unable to resist the temptation of such a unique dining experience, Buckland snatched the heart and gobbled it up before anyone could stop him. Sir Thomas Phillipps, 1st Baronet, had a condition he termed “vello-mania.” Today, we would use the term “bibliomania” – an obsession with the collection of books. His dedication went far beyond that of the common hoarder. His biographer claimed that Phillipps amassed the largest private collection of books and manuscripts – around 100,000 at the time of his death in 1872. Everything was secondary to his books. Most of the rooms in his mansion dubbed Middle Hill House were used as space for his precious tomes. His wives and daughters had the duty of looking after the collection. Phillipps wasted all of his fortune on books. He would buy entire bookstores at a time, even after he ran out of money. Antiquarians, servants, builders, and store owners were all left unpaid. The baronet’s eldest daughter fell for a man named James Halliwell. He was an antiquarian, but was once accused of stealing manuscripts from Trinity College and selling them. A book thief was something Sir Thomas could not abide so he denied Halliwell permission to marry his daughter. They did it anyway. Phillipps hated the idea that Halliwell might inherit Middle Hill House. Therefore, he had all the copses cut down and sold the lumber. With the money, he bought another mansion called Thirlestaine House and used over a hundred wagons to relocated his book collection. He then purposely let Middle Hill House fall into ruin. Despite his efforts, the baronet’s treasured items eventually ended up in his family’s possession after his death. It took over a century to sell all of the books and the last items went at auction in 2006. Another notorious British cheapskate was John Elwes. He became so renowned for his penny-pinching ways that he is credited as the inspiration for Ebenezer Scrooge from A Christmas Carol by Charles Dickens. Born John Meggot in 1714, Elwes might have inherited his thriftiness from his mother. Despite being extremely wealthy, she supposedly starved herself to death because she spent so little money on food. Frugality seemed to run in the family. Elwes’ uncle was Sir Hervey Elwes, 2nd Baronet. Despite being even richer, he was also more ascetic. In fact, John Meggot was said to be somewhat of a profligate in his youth, but learned financial abstinence in order to impress his childless uncle and become his heir. He even changed his name to Elwes to appease him. The plan worked and Elwes inherited his uncle’s fortune. If anything, having more money made him even more miserly. He would spend the nights in darkness to save on candles. He wore a single suit for months at a time, even in bed. He would eat moldy food which he served in the kitchen to avoid making a fire in a second room. He would walk in the rain rather than pay for a coach. On one occasion, he allegedly wore an old wig he found discarded in a bush for weeks. Curiously, even though Elwes saved his money, he enjoyed watching his peers spend theirs. He often visited London’s gambling houses and had no qualms about lending large sums of money. He didn’t even pester his borrowers for repayment because he deemed the behavior ungentlemanly. Although he was an accomplished mathematician, Napier also had more outlandish interests. He was particularly keen on theology, specifically the Book of Revelation. He studied it and predicted the Apocalypse to occur sometime between 1688 and 1700. It didn’t, as you may recall. There were also rumors that Napier dabbled with the occult. These suspicions likely stemmed from some of the scientist’s eccentricities. He typically dressed in black with a long flowing cloak. Allegedly, he had a habit of carrying around with him a black spider in a box. He also kept a black rooster as a pet which some people feared was actually his familiar. There is a story of how Napier used his reputation to catch a thieving servant. He made all his house attendants go inside a dark room, one by one, and pet his rooster because the bird had the power of telling who was guilty. What really happened was that Napier covered the rooster in soot. All the innocent servants stroked the animal and came out with dirty hands while the guilty one only pretended to pet it and his hands were clean. Joanna Southcott was an 18th century woman who started a religious movement based on her prophecies. At the height of its popularity, there were over 100,000 “Southcottians” in the world. When she was in her 60s, Southcott claimed to have become pregnant with the new Messiah. Of course, the baby failed to present itself and the prophetess claimed that it was immediately called up to Heaven after birth. Southcott died in 1814, just a few months after this alleged birth. Joanna Southcott’s legacy became even stranger after her death. She left behind a box and in this box were the things that will fix the problems of the world. However, she also left specific instructions that said that the box should only be opened in a time of national crisis and in the presence of 24 bishops with the Church of England. In 1927, psychic researcher Harry Price had the box in his possession. He x-rayed the Southcott box and found it to be filled with random everyday items such as books, a dice box, a night cap, a horse pistol, and a lottery ticket. By the end of his career, Sir Francis Dashwood, 11th Baron le Despencer, had held multiple prestigious positions such as Chancellor of the Exchequer and Postmaster General. In his younger days, however, he seemed more concerned with having a good time. When he was a young adult, Dashwood went on a Grand Tour of Europe, as did many wealthy men of his age. He got into trouble while visiting the Russian Court because he thought it would be funny to dress up as Charles XII, King of Sweden and enemy of Russia. Furthermore, it is alleged that he also tried to seduce Tsarina Anna. Back in England, Dashwood helped found a club called the Society of Dilettanti in the early 1730s. Officially, it was a gathering of aristocrats who wanted to share their love of Roman art. However, copious amounts of alcohol were usually involved at these meetings. Horace Walpole once accompanied Dashwood and other members to Florence. He later wrote that there seemed to be two qualifications needed for membership: to travel to Italy and to be drunk. Dashwood’s main claim to fame was founding the Order of Friars of St Francis of Wycombe, better known as the Hellfire Club. It wasn’t the first secret society with that name, but it was the most notorious. Their motto was “Fais ce que tu voudrais” (Do as you will). In their case, it involved plenty of drunken debauchery and mock religious ceremonies. Many prominent British figures of the time were members and even Benjamin Franklin was alleged to have attended several meetings during his time in England.